I was really meaning to create a good recipe for a post today but I've been gardening to exhaustion, and we ended up eating leftovers of a not so great dinner. I would like to be planting and refining new garden spaces, but what I'm doing is WEEDING. I'm sure I've mentioned our invasive-vine woes before, but really, it's so depressing. Every time I think progress has been made, new shoots of these hideous stucco-wreckers start emerging from the ground. There are thick roots deep under the ground and no matter how I dig at them, they won't budge. Sometimes I manage to withdraw a large section of root and spray myself with a pound of dirt in the process. Last year we paid professionals to remove them and they rototilled the perimeter of the house, and removed a startling quantity of roots, but many large roots are still there. I've got a bunch of plants ready to go into beds but we still have a lot of pre-planting work to do. Actually, I think my husband is still out there digging. My son made his excellent black bean burgers and potato salad. We had sweet potato fries with a simple tofu and broccoli stir fry and we made a great stir fry with mushrooms, kale and rice noodles. (The fries were roasted with lots of rosemary which added a fantastic flavor. I baked a 100% white whole wheat no-knead bread with toasted black sesame seeds. One night, too tired to cook, we got salads from a nearby Middle Eastern restaurant, called Lulu's. They have a deli service at the back of the restaurant and we purchased tabouli and fattoush. I would love to pass along the marinated tempeh recipe but I don't have permission to do that so I'll just say what was in it and a offer bit of prep info. For Marinated Pan-fried Tempeh, a package of tempeh is cubed and marinated for several hours in lemon juice, apple juice, tamari, dry mustard, fresh grated ginger and minced garlic. It's then fried in a small amount of oil until browned. 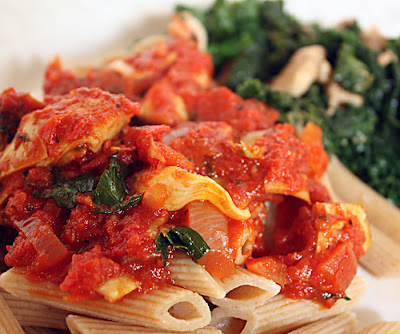 Everything we make from the Lorna Sass cookbook turns out great, and I highly recommend it as a basic vegan cookbook. If you are a fan of Silk soymilk and Whitewave tofu and tempeh (owned by food giant Dean Foods), you might want to read this disturbing report from Organic Consumers Association and Cornucopia Institute. Most Silk products are no longer organic and the soybeans used for production are now mostly from China, not North America. Dean Foods is also heavily into inhumane factory farming. Thanks to LK Sisters for blogging about this. We were listening to a re-broadcast of an interview by public radio host Joy Cardine with Jeffrey Moussaieff Masson, author of "The Face on Your Plate," "When Elephants Weep," and "The Pig Who Sang to the Moon." The host said she was a vegetarian, and proceeded to relate a brief story of the moment she knew she could no longer eat meat. It got me thinking of the moments we remember in life — usually traumatic national events that we can never forget. But what about the other, more personal life-changing events we experience, like deciding to become vegetarian, for example. Do people remember "the day they decided not to eat meat anymore?" Well, I do. I was in my 20s and had been going through dietary changes for a while. First I decided to eat healthier. I'd been reading about diet and health and the dangers of the "Standard American Diet" and decided to make a clean sweep of all the unhealthy food in my (and by default, my husband's) diet. I went through the pantry and bagged up all the white stuff — you know, white flour, white pasta, white sugar — all of it. Being a frugal person by nature, I was filled with anxiety about what to do with all this stuff. I didn't want to contribute to another's ill health, but I hated just throwing it away. So, I hauled it across the street to my friend Suzanne's apartment, explained that I wanted to improve my diet and not eat this stuff anymore because I believed it to be unhealthy, and asked if she wanted it. After all, everyone has their own ideas about what's healthy, and can make up their own minds. I told her what I knew. She looked at me intently for a moment, and then said, "SURE!" Then, with great enthusiasm, she started unpacking the bags. I assuaged my guilt by thinking that she would just go out and buy this same stuff anyway. Eating healthy was going well, and I began to think about a vegetarian diet. We'd been attending meditation retreats where there were lots of vegetarians, and I'd been doing more reading and thinking about food issues. Then we went on a camping trip to Canada, and one evening we attended the nature program at the campground where we were staying. A film was shown about the plight of prairie dogs. One of the struggles facing this little animal was its misfortune to be living on cattle ranches, where the prairie dog tunnels cause injuries to the cattle who step into the holes. There were graphic shots of ranchers blasting the prairie dogs with their rifles; no gory detail was spared, and it was horrible. You can probably see where this is going. Anyway, I just couldn't get those images out of my mind. We were in the supermarket checkout line after our return home, and I was staring at a package of stew meat in our cart. I picked it up. "Do we really want this?" I asked my husband? "Probably not," was his reply, and I took it back to the meat counter. And that was it —the day I decided to be a vegetarian. And do I remember the day I became vegan? Of course, but that's another story for another day. My first attempts at cooking vegetarian food were pretty grim. The very first dish, chuck full of brewers yeast, got ditched. But it's a lot easier to be vegetarian now, and even vegan, than it used to be. There are countless amazing cookbooks and blogs with recipes and ideas. I recently reviewed Peta's Vegan College Cookbook, and although it wasn't generally suited to my style of cooking, there were a few recipe gems that I really enjoyed cooking and eating. This recipe was inspired by one of them. 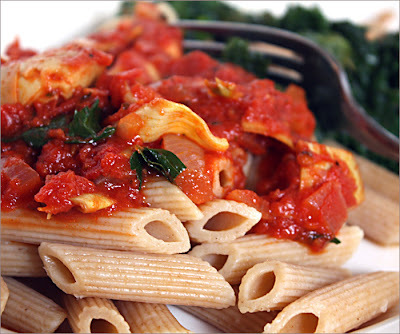 If you use canned beans and tomatoes, you can throw it together with almost no effort. Or, if you prefer, you can cook dried beans and roast your own tomatoes. I like to make the bean and tomato mixture pretty spicy because I love the contrast between the spicy beans and the sweet potato, but you can just leave out the chilies or jalapeños if you don't care for spicy food. Slice a very small piece from the end of each potato. (Or, you can prick them all over with a fork.) Bake at 425˚F for about 40 minutes or until nice and soft all the way through. You can bake them right on the oven rack. I like to use the toaster oven for this unless I'm using the big oven to make other stuff, too. When they are ready, place them on a plate to cool slightly while you finish up the filling. Cook the the onion, garlic and oregano (and jalapeños, if using fresh) in the oil (or broth or water if you don't use oil) for one minute. Add the beans, tomatoes, canned chilies (if using), paprika, salt and pepper. Heat gently until hot. Stir in two tablespoons lemon juice, and the parsley or cilantro. Taste for seasoning. Open the avocado and scoop out the pulp. Mash and mix with two tablespoons lemon juice, a tiny pinch of salt and fresh ground pepper. Split the potatoes lengthwise and gently push the ends towards each other to create a pocket. 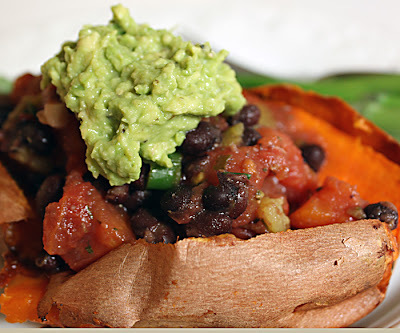 Fill the pockets with the bean mixture and top with avocado or vegan sour cream. 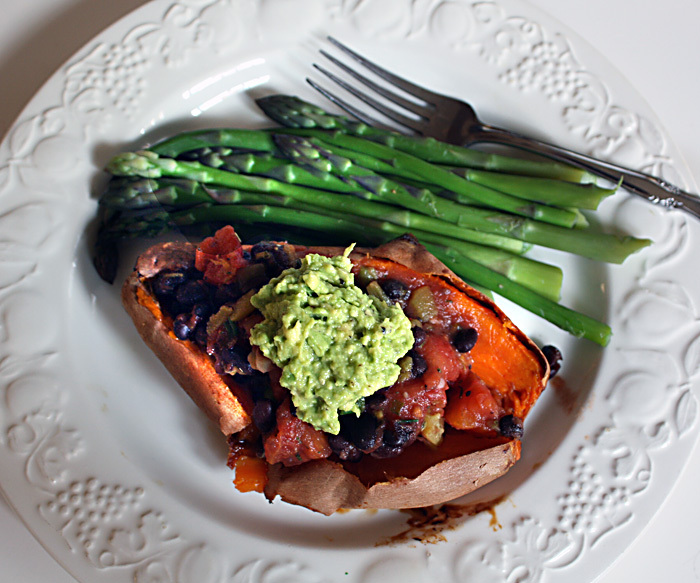 In the distant past, we've been members of two different vegetarian dinner groups. The first one was a macrobiotic group, and we met once a month for a potluck, usually at our house. It was a lot of fun and the food was always wonderfully delicious and healthy. And I loved that our kids could take part, and see that yes, there were other people who ate like we did. After the demise of that group, we joined another one that alternated between potlucks and restaurants. It was organized by a woman who was upset that we wanted to bring our children. (always well-behaved) An informal vote was taken and everyone wanted the kids included except for the leader. We tried to compromise by only bringing them once in a while, but the leader eventually decided not to come anymore, and guilt caused me to assume the role of organizer. She'd said it was a lot of work to keep the group going, and she was right. There just weren't enough interested vegetarians around to have more than 8–10 people show up for events, and even that was hard. We didn't have the benefit of a Web site, and organizing an event involved LOTS of phone tag. Eventually I passed on the "leader" role to someone else, and he gradually gave up. Many of the regulars moved away and it was hard recruiting new members. We finally, now that we're just about to move away ourselves, found a new veg group with lots of members. We read about it in the local paper, which just goes to show you how (almost) mainstream vegetarianism has become. We recently attended our first event — a dinner at Africana that attracted 50 people! Africana is a restaurant specializing in West African cuisine. The food was interesting and tasty but there were a few rough spots concerning quantity, menu substitutions and slowness. I think the restaurant staff may have been overwhelmed with serving so many diners at once. 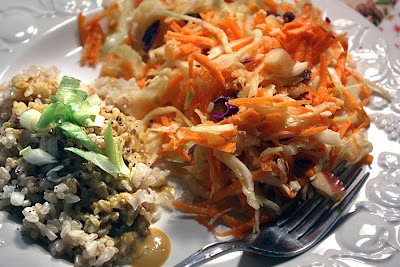 The main dishes were basically sauces with a few veggies, served over rice and/or couscous. There was a 45 minute wait between finishing the first entrée and beginning the second, which made for a very long weeknight event. For an appetizer we had alloco, or fried plantain, which tasted good but was very greasy. Then we were served three saucy dishes with rice and couscous. There was maffe which is a peanut-based sauce with veggies, okra sauce, and a piquant tomato and onion sauce with veggies. The last dish to arrive (after a 45 minute wait) was a vegetable stew. Everything was vegan, which is always a treat in itself. Would I recommend Africana? If you are dining with omnivores, it might be a good place to go because of the wide variety of interesting food choices, but it doesn't specialize in providing vegetarian food, meaning the meat dishes look a whole lot better than the vegetable ones! The dishes were tasty, but basically seemed like sauce over rice. There wasn't anything to compensate for the lack of meat, like chickpeas or other legumes, and the veggies were a bit scarce. To make your own version of a delicious peanut stew, try Spicy peanut stew. 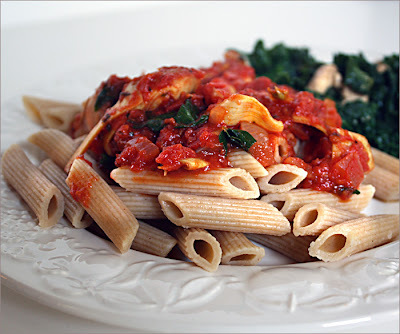 The winner of the "Peta's Vegan College Cookbook" giveaway is Jennifer. (There was more than one Jennifer. The other Jennifer, who didn't win, was Jennifer B.) Please send your mailing address to me by midnight Friday, May 22 at: cookeasyvegan@gmail.com and I'll post the book to you a.s.a.p. Congratulations and happy cooking! Instead of posting pictures of food today I'm posting pictures from my spring garden. I suppose I should be posting about the Egyptian onions, rhubarb and lettuce, but I've been obsessed with taking photos of flowers so here are a few from my collection. The last cooking class we took at the Willy St. Coop with Chef Paul was a Chinese cooking class with vegan options, and it included seafood and chicken. This class was called "Vegan All the Way" and it was pretty amazing. I'm trying to remember the order of events, but when I think back to the class it seems like Chef Paul was doing five things at once, so I'll do my best to describe what he did. On the menu was polenta with toasted almonds and herbs served with roasted red pepper sauce, roasted vegetable moussaka with tempeh, and braised belgian endive with tofu, fresh pineapple and summer vegetables. Also, marinated mushrooms with fresh lentil pasta. Paul made the pasta dough early on because it needed time to rest before being rolled out. I've never see pasta like this before - it contained cooked, cooled red lentils. The chef works the lentils into the flour. After the dough had rested, covered with a damp towel, it was rolled into a thin circle, sprinkled with flour, rolled up into a tube shape and cut into about 1/4" wide strips. More flour was sprinkled, the noodles were flipped around to unfurl them and they were cooked in a large pot of boiling water for 2-3 minutes. The button mushrooms were quartered and marinated in soy sauce, rice vinegar, garlic, scallion, sweetener, salt and pepper. These were probably the best noodles I've ever tasted with a texture that was both chewy and tender. Somehow, at the same time he was kneading the pasta dough, Paul also had slices of eggplant and zucchini for the moussaka roasting in a hot oven, and polenta cooling in the fridge — and a red pepper charring on the gas stove. For the polenta, coarse cornmeal was cooked in vegetable stock until thick. After removing it from the heat, lemon zest, toasted almond slivers, olive oil, minced fresh herbs, minced shallot, red pepper flakes, salt and pepper were added, and the mixture was packed into a large, shallow, round pan and placed in the fridge to set up. Roasted red peppers, minced garlic and olive oil were pureed with a stick blender, and then enhanced with fresh herbs, salt and pepper. The polenta, still slightly warm, came out of the fridge, got cut into triangles and was served with the sauce. Delicious and elegant. On to the moussaka. Onions and garlic were sautéed then cooked with cinnamon, nutmeg, cayenne, seeded and diced tomatoes, chopped tempeh and lemon juice. It was simmered to reduce the tomato liquid. The roasted eggplant and zucchini (mentioned earlier) were layered with the tempeh mixture in a glass baking dish. The dish was topped with a mixture of garbanzo flour, dried herbs, oil and bread crumbs. The moussaka was baked until the topping was golden. photograph things when they look and smell so good. The last thing on the menu was braised vegetables. This dish contained fresh ginger, garlic, jalapeno, fresh pineapple, carrot, brussels sprouts, summer squash, asparagus, firm tofu and vegetable stock. (It was supposed to have endive and not brussels sprouts but a substitution was made to accommodate availability.) It's intended to be served over steamed rice but we ate it straight up. This was really delicious. The layers of flavor, gorgeous appearance and heavenly aroma of the food prepared in this class were an inspiration. One of the things we also learned in class was not to waste anything. For example, even the tough stems that are snapped off the bottoms of asparagus stalks can be peeled and cooked! And all of the vegetable trimmings can be made into stock or composted. Don't forget that tomorrow is the deadline for posting comments about why you would like to own a copy of "Peta's Vegan College Cookbook." I'll announce a winner on May 21. Whoa. At our house I was beginning to suspect that the refrigerator and the compost pile had become one and the same. It was not yet time to call 911, but it was definitely time to clean out all the odds and ends of things that tend to get pushed to the back of the shelves and the bottom of the bins. As I cleaned out the unusable, I came upon an orphan white beet, a single little pepper starting to shrivel, two partially used bags of potatoes and some enormous carrots. Not to mention a bowl of water with a lone chunk of tofu, and a lot of very ripe small tomatoes. After all that cleaning I needed something really easy to cook, and decided I might as well roast the stuff I'd found. Roasting veggies is so easy it doesn't feel much like cooking, but the results are wonderful. 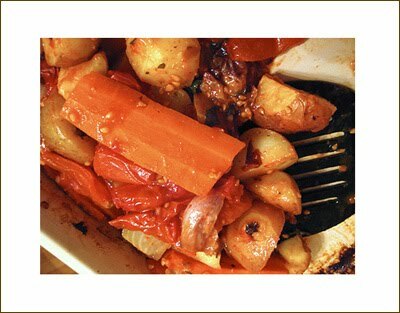 I used yellow and red potatoes, a humongous carrot, a white beet, garlic cloves, a small banana pepper and a lot of small red tomatoes. I preheated the oven to 425˚ and cut the potatoes and beet into smallish chunks. The carrot got cut first into 3" sections and then into lengthwise slices. I added some olive oil and turned the veggies to coat them, and I mixed in a handful of chopped parsley. Some unpeeled garlic cloves also went into the earthenware pan with the veggies, and two 1/2" thick slices of tofu were coated with a little tamari and laid on top. The veggies were more or less in a single layer in a large, uncovered dish. After 30 minutes in the oven, the tomatoes were added to the dish, and it went back into the oven for another 20-30 minutes or so, until the potatoes were cooked. When I took the pan out, I squeezed the garlic cloves out of their peels and mixed it into the veggies, and I broke up the tomatoes a bit to let the steam out. Some fresh ground pepper and it was ready to eat. I rarely add salt to vegetables, especially roasted ones that have so much natural flavor, but everyone has different tastes so add the seasonings you think are needed. You could drizzle on a little balsamic vinegar if desired. I had planned to squeeze lemon over the top but forgot all about it. Next time. I was asked to review Peta's Vegan College Cookbook and was really looking forward to it even though it's been an awfully long time since I was in college. I don't know what I was expecting, but when I first saw the recipes, I was a little worried. For one thing, everything that's cooked, is cooked in a microwave (though you could adapt the recipes to stove and oven). And the recipes are heavily dependent on canned, frozen and fake food - lots of fake food. Not my usual style of cooking, but it makes sense, when you consider the lack of cooking facilities dorm residents face, coupled with their lack of storage. They often have a tiny refrigerator and a microwave in a micro-room. Not to mention the not- yet-fully-developed cooking skills of many college students, living on their own for the first time. Most of the ingredients are standard supermarket stuff, but some things, like vegan cream cheese and vegan mayo may be harder to find depending on where you live. The book starts out by suggesting a list of staples to have on hand, and offers an extensive and very helpful list of meat and dairy alternatives, including brand names. The recipe section is divided into categories for breakfast, sandwiches, salads, soups, sauces, dinner, drinks, dips, snacks and desserts. There also are special sections for student staples like peanut butter, potatoes and ramen. The brand name product list was especially helpful since I'd never purchased "chicken strips" and didn't know what to look for! To be perfectly honest, the first few times I looked at the recipes I couldn't find anything that I'd actually want to eat! I laughed at the sandwiches — do you really need a recipe that tells you to put hummus, lettuce and tomato between two slices of bread? Or cream cheese on a bagel? There's even a "recipe" for ants on a log (called Ants on a Blog). Many of the recipes called for such excessive amounts of vegan cream cheese and mayo — sometimes in the same recipe — I could feel my jeans getting tighter as I read the list of ingredients. I scratched my head and agonized over how to be fair but honest. I wanted to like this book, I really did. So, I sat myself down and took a much closer look. It's true there's a recipe calling for one cup of mayo to make a dressing for two people to dip pizza into, but on looking closer, I found lots of healthier choices, too. Something for everyone. And, if you're a new, aspiring vegetarian or vegan coming directly from a meat-eating family, maybe a few ideas for the simplest meals a vegan can throw together is exactly what you need. I decided to actually try a few recipes from several of the categories before passing judgement, choosing a mix of healthy and less healthy foods. The first thing I tried was definitely on the healthy side — The Sweetness 'Tater Salad — from the potato section (photo above). It contained raw, grated sweet potato, shredded cabbage from a bag, shredded carrots, raisins, apple, canned pineapple, lemon juice and olive oil. 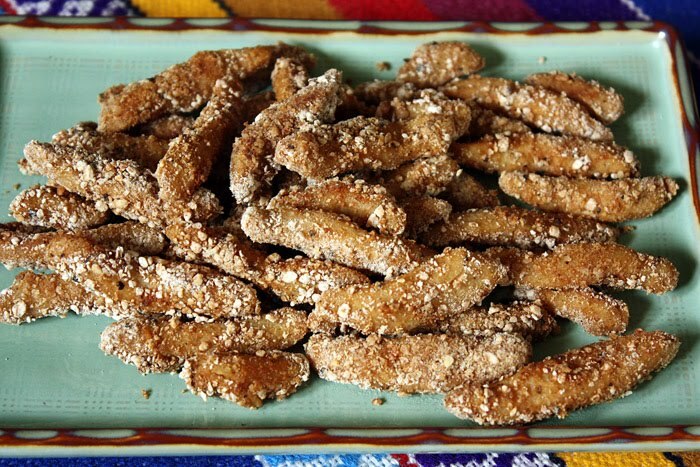 It was quick and easy to make, light and crunchy. It was supposed to serve two but there was an enormous amount that would easily serve four or more. Two of us happily ate it for dinner and lunch the next day, and there was still some left. I also made Super Cheezy Sauce to serve over precooked (Trader Joe's frozen to keep with the book's theme) rice. This was practically an instant sauce with yeast flakes, soy sauce, olive oil and water, and tasted surprisingly good. I made WTF? Wings (that's right) out of chicken strips (photo above), and although they were too salty for me, my son ate them all! They were tasty and chewy and I think anyone looking for a salty meat-like main dish or snack food would find them yummy. 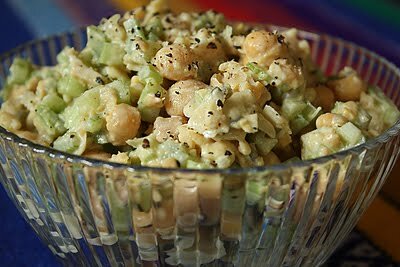 For a healthier dish from the salad section, I made In a Pickle Chickpea Salad, and it was incredibly quick and really delicious — something I would make again. In the dinner section, I decided on two dishes, one healthy and one — ahem —less healthy. 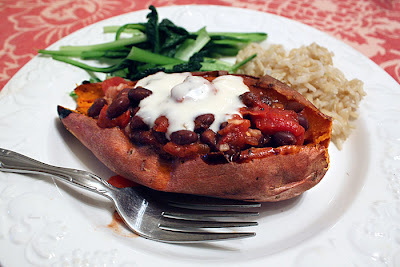 The healthy one, a delicious recipe called Tough and Stuffed Sweet Potatoes (photo above), had sweet potato, black beans and tomato, and the other, Chick Magnet "Chicken" Casserole (photo below), had everything from tofu to vegan cheddar to corn chips to chicken strips and more — probably enough salt and fat to supply an adult for weeks. For balance, I tried EZ Cheezy Broccoleezy (photo above) from the snack section. The casserole was probably the strangest thing I've ever "cooked" in my adult life, but it was delicious. It was the kind of thing a busy person, student or not, could serve to omni friends, and they'd love it. It's hard to believe it's vegan. (To cut the salt content a little, I only used half the recommended amount of chicken strips and no additional salt in the filling, but it was still intensely flavorful.) 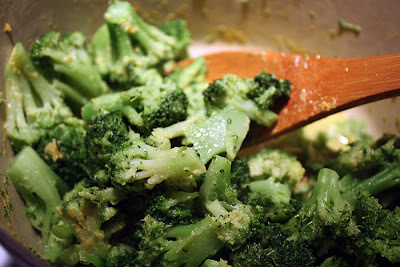 The broccoli was fine if you don't mind the slightly rubbery texture of frozen veggies. But who can complain about broccoli as a snack? I couldn't resist the ice cream and pudding pie recipe from the dessert section. I had the ice cream and pudding ready to go, but then reconsidered. It didn't seem possible to mix ice cream and pudding and place it in the refrigerator for a few hours, and end up with anything but ice cream soup. I guess the recipe meant to say, "vegan pudding mix" not "vegan pudding." And what kind of pudding mix? Would that be Jello instant pudding? Well, I just couldn't bring myself to use that chemical mix — chicken strips were challenge enough! — and the other pudding mixes I encountered either had to be cooked or mixed with tofu. So I made my own instant dessert with the ice cream and pudding. 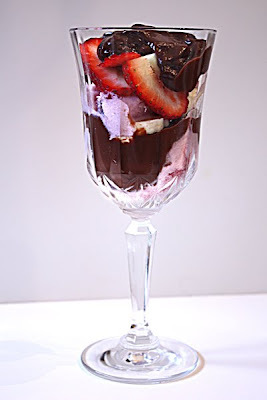 I layered raspberry ice cream with chocolate pudding, sliced strawberries and sliced bananas. It wasn't a pie, but it was good — my contribution to the next edition! And proof that the book offers inspiration as well as recipes. The authors have fullfilled their promise. 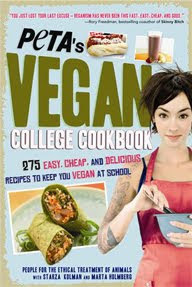 Peta's Vegan College Cookbook would be a great reference for making quick, easy and enjoyable vegan food. It's filled with ideas for making the most of limited cooking equipment and supplies. With a very small amount of effort, even a student in a dorm room can enjoy delicious, vegan meals and snacks, and create dips, spreads and even whole dinners for parties. I'm not sure I would consider it cheap, though, as the authors imply. Living on packaged goods is much more expensive than cooking from scratch, but the book is primarily intended for those with limited access to cooking facilities. If you've gotten this far and think you'd like to own the book, or give it to your favorite college student, leave a comment to that effect by May 20. (U.S. and Canada only, sorry) I'll randomly choose a name and announce the winner on this blog. Once the winner sends me a mailing address, the (slightly used) book will be on it's way! It's not just on Mother's Day that I miss my mother, but it's the day when her no longer being here is hardest to ignore. When I ask myself what I miss the most, the answer is, I just miss her. I miss talking to her on the phone, sharing day to day trivia. She was unconditional in her love — she'd get angry but she'd quickly forgive. She took so much pleasure in the accomplishments of her children, whether large or small, that it was impossible not to feel important in her eyes. I miss her. Just look at what was inside the box sent to me by my oldest son and daughter-in-law. Yes, they taste(ed) as good as they look! It's getting late and I'm tired but I wanted to post something, so I'll make it quick. I planned to post a few recipes inspired by "The Chicago Diner Cookbook," and after posting one last Saturday, I didn't realize it would take me so long to get to the second one. There was always something getting in the way. Even this afternoon, after I went to Trader Joe's for mushrooms, I came home to discover we were out of quinoa! Then there was something slimy in the vegetable drawer that needed to be cleaned out, etc. etc. 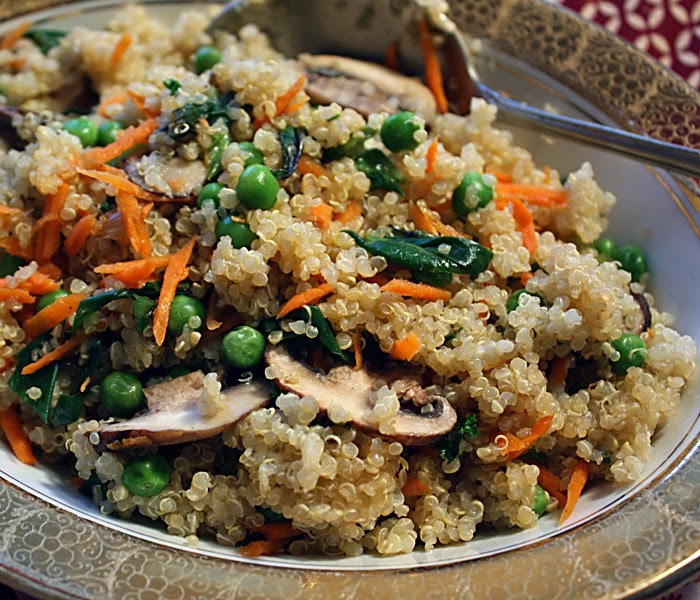 I finally got some quinoa, made the pilaf and served it with baby bok choy and edamame in a mild peanut-lime sauce — tasty, easy and pretty. Rinse the quinoa in a fine mesh strainer under running water. Place the quinoa and broth (or water) in a pot and bring to a boil. Turn the heat to simmer, cover the pot and cook for 15 minutes. Turn off the heat and allow to sit, covered, for 5 minutes. In the meantime, sauté the mushrooms and onions in the oil for 2 or 3 minutes. Add the carrot and peas, cover and turn off the heat. Let sit until the carrots and peas are warmed through. 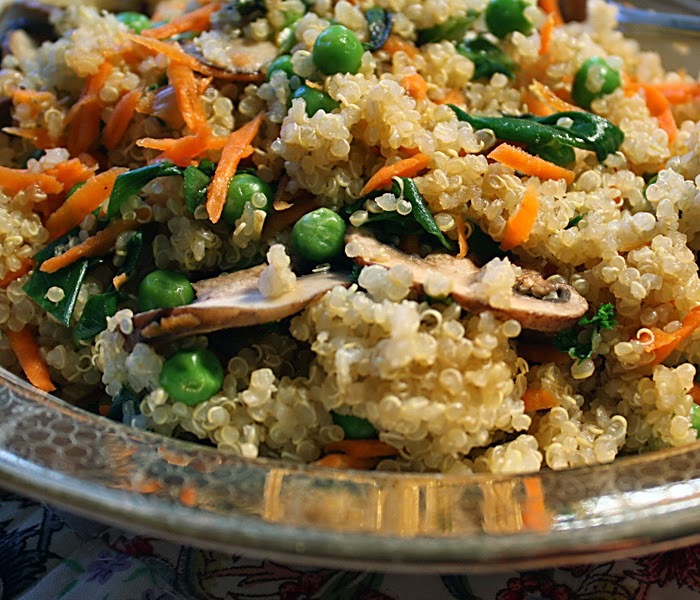 Stir the veggies into the quinoa. Add the parsley and season to taste with salt and pepper, if needed. Spring seems to finally be here at last, and that means lots of you are probably thinking about digging, planting and growing flowers, herbs and veggies. I was outside yesterday digging weeds, moving plants and thinking about the advice I wish someone had given me when I was just beginning to garden. So, for anyone new to gardening, thinking plants are hard to grow, worrying whether you have a green enough thumb, I'm about to give you a bit of advice that you should heed. As you peruse the garden centers, farmers markets and catalogs, beware, be cautious, watch out for the three words that can spell disaster. These words are: easy-to-grow. Easy-to-grow. Sounds so promising, doesn't it? Actually, easy-to- grow can be a euphemism for invasive species. That's right. They hook you with that easy to grow jargon and sell you something you will regret planting for a long, long time. Just google "plants I wish I'd never planted" and you will find lists of easy-to-grow plants. Plants like Lysimachia clethroides, otherwise known as gooseneck loosestrife. Ahem. Just do your research to make sure the easy-to-grow plants you've selected aren't also on an invasive plants list. My house suffers from what I call the "sleeping beauty effect." Some day I fear I'll oversleep and have to hack my way out through the vines with a hatchet. The person who lived here before us planted every invasive plant in the universe, and we've spent countless hours (and dollars) trying to remove the tenacious plants that wreck our stucco walls and grow with abandon throughout the yard. Vines have damaged our phone lines and covered our windows. One thing is true of all the invasive plants on our property — they are easy-to-grow! Easy, easy, easy to grow. Of course not all easy-to-grow plants are bad. Some are great. On a positive note, here's a tasty plant that's easy-to-grow and recommended! It's not hard to control if you give it its own area in the garden. Egyptian onions look like normal green onions at first, but grow bulbs at their tops, fall over and plant themselves, to reproduce and spread. They come up early in the spring and are used like green onions. I harvested two to use in the tempeh salad I'm about to describe. We recently hosted a party for my husband's grad students and one of them graciously brought a vegan cake from Whole Foods. As I was putting the leftovers away, I noticed that the cake had come from The Chicago Diner, a favorite vegan restaurant in the windy city. It's been years since we've been there, but we have "The Chicago Diner Cookbook," and for old times sake, I got it out and found some recipes to try. I've changed the quantities and added an ingredient or two, but this recipe for tempeh salad is based on one from the cookbook. 1/4 - 1/2 cup vegan mayo (I used Veganaise.) I think 1/4 cup, or even less, is enough but you might like more. Try the smaller amount first. Split the tempeh through the entire cake so you have two, thin, large pieces. Cut these pieces into small squares. Sauté the tempeh in the oil in a wok or heavy skillet until it turns golden, about 5 minutes. *see note. Turn off the heat and stir in the tamari to coat the tempeh evenly. Place the tempeh in a bowl and add the chopped vegetables and the mayo and mix well. This is delicious as a salad on a bed of lettuce, or as a sandwich filling. Even my tempeh-resistant son ate it and said it was really good. *Note: My tempeh was frozen so I simmered it in a small amount of water for about 10 minutes until it was defrosted, before I sautéed it. Simmering or steaming tempeh gets rid of any bitterness and gives it a milder flavor, so you might want to do this even if your tempeh isn't frozen. EXTRA EXTRA: Ricki over at Diet Dessert and Dogs is giving away copies of her newly published cookbook, "Sweet Freedom." Click over to DDD and enter to win your copy. MORE GIVEAWAYS: You can enter to win a new 6-quart Crock-Pot Slow Cooker at Mudpies and Mary Janes.